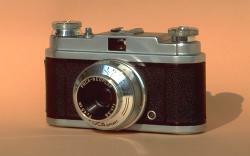 The Foca Sport was a very popular French camera. Made by the french firm OPL (Optique de précision de Levallois) Foca, the Foca Sport was first produced in 1954. It was a very popular camera. Designed for the general public, the first model was quite simple : unaided focusing, no light meter, a 45 mm f/3.5 Neoplar lens, and a shutter giving speeds from 1/300 s to 1 s plus B pose and flash synchronisation. It was gradually upgraded : the film advance knob was replaced by a lever and some were fitted out with a collimated finder and a light meter. Its successor, the Foca Sport II, was fitted out with a coupled rangefinder and a better lens.